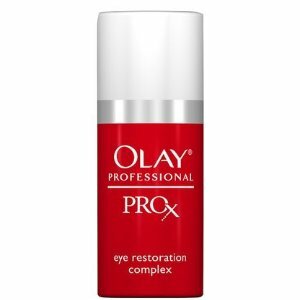 The Olay Professional Pro-X Eye Restoration Complex is the best Eye Cream I have reviewed so far and is the first one that deserves 4 stars! I’m using this fragrance-free eye cream now for almost a year and I have convinced most of my friends too. The Olay Pro-X Eye Cream feels very nice and silky. It also absorbs quickly and you’ll wake up with less puffiness under your eyes (we only use it at night, during our sleep), which first felt unbelievable. It contains ingredients like caffeine, which apparently works. The directions say that you have to apply it twice a day, but as I wrote earlier, we use it at night because of the sunblock (anti-aging) products we are using during the day. Just like any other cream (without make up) you will not see instant results. After a week or two you will see improvements. Why didn’t it have 5 stars? First of all, we are not that easy. A 5 star product means that the product is perfect and does everything that it describes. This will probably never happen, because (the marketing department of all the) skincare brands always exaggerate! It doesn’t remove fine lines. It isn’t cheap either, especially not for an Olay product. Its $30 for 0.5 fl. oz. (15ml). We don’t run out that quick, because we apply just a little. Conclusion: Don’t expect miracles from any cream, also not from Olay. Expect a good eye-cream that’s moisturizing during the night and reduces puffiness around the eye area. Your website is amazing! I love the comparitive content by product. Can you do something on Jeunesse product lines? I would love to see how they stack up against the rest.